Mob Museum toasts Repeal. 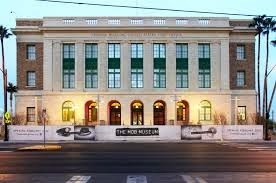 This Repeal Day, The Mob Museum, The National Museum of Organized Crime and Law Enforcement, will become THE most spirited place in the nation to celebrate the anniversary of the end of Prohibition (December 5, 1933). Beginning with a celebratory toast with Oscar Goodman, events will also include a Backyard Bootlegger Party, the first-annual “Boss of the Bars” competition, as well as a VIP Roaring 20s Speakeasy. Downtown Grand is also offering a room rate of $29 so you can stay and play. To book this special rate call 855.DT.GRAND (855.384.7263). The rate is $29.00 + tax + Grand Experience fee. Please use offer code REPEAL. * Pizza Rock is also offering Buy One Get One Free Slices and Buy One Get One Free Beer (16 oz. or smaller). * Oscar’s restaurant at The Plaza Hotel and Casino is also offering 20% off dinner service. * You must have a Repeal Day wristband in order to get this discount.